We would like to congratulate Year 11 student Zane Trew on his outstanding sporting achievements. 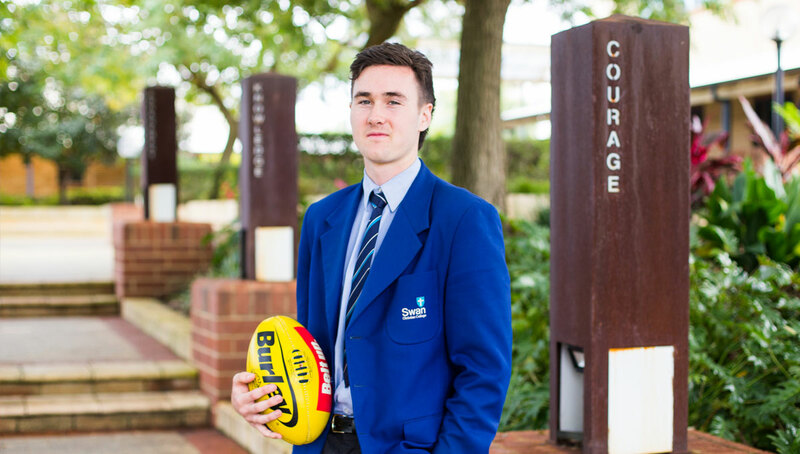 In 2017, Zane was picked for the State 15s AFL squad and this year, he was selected for the State 16s AFL Academy and played in Adelaide, The Gold Coast and at the Gabba in Brisbane. He was then selected as part of the elite squad, as the WA Midfielder, for the All Australian Team. Zane has been playing football since he was in Auskick at the age of 5 and has since developed into a focussed footballer who is keen to play at the highest level. He has also been trained by our very own Mr Simon Bergin at Swan Districts, who has been of great support to Zane and the boys at Swan Districts FC. Today, Zane plays for the Hills Rangers FC and has just completed a season of training with the State 16s Academy under Tony Micale, where he trained twice a week at Domain Stadium and in Claremont. He continues to train 2-3 times a week at Steel Blue Oval with the Swan Districts Colts team, under Greg Harding. The College would like to congratulate Zane on his outstanding sporting achievements and we wish him all the best for the future!